Please click here for a printable version of this information. Submit your intraoral scan through your scanner software, or attach it when submitting your online DIBS Rx. For help linking your scanner to OrthoSelect, go to www.myorthoselect.com/4-things-for-getting-started. Once we have received BOTH the prescription form AND the intraoral scans of your patient, we can begin. Brackets are accurately placed on each tooth, per your Rx and preferences. The software provides post-treatment simulation and other helpful tools. Once lab work has been completed, we’ll notify you that the case is ready for your approval. Open the case by logging in to your online dashboard, finding your patient, and clicking on the Approve button. Use the tools and post-treatment simulation to review the case and make any final adjustments to the bracket positions. Once you are satisfied, simply click the “Approve” button to alert us that you have approved the case. After case approval, the DIBS lab will proceed with digitally creating the IDB tray, which will be 3D printed and shipped to you. (Or, if you are printing in-office, the final print file.) To prepare for the bonding appointment, insert the appropriate brackets. If you’ve ordered the DIBS Plus service, you will receive your trays with brackets pre-inserted. For a bracket-insertion training video, go to https://youtu.be/4gjAC9CjqCg. Follow pumice/prophy technique on DIBS Procedure sheet (Pumice with cotton swab only on the day of bonding appointment). Place protective glasses on patient. After pumice, while patient is rinsing, proceed to the next step (Prep). 6. Prep the DIBS IDB tray before prepping the mouth. Place composite on each bracket. Keep in mind, the adaptation of the bracket to the tooth will be accurate and intimate, so typically only a small amount of bonding adhesive is required. Place tray in a light-proof box or under a dark alginate bowl. Your trays are now ready when you are. Tuck cotton rolls on the lingual to help with comfort of the tongue garage. Tip: If bracketing 6s and 7s, be aware of Nola tubing, which can be lifted to properly seat the tray. The side-guards are also designed to squeeze inward, lingually. Etch one arch at a time, starting with the lower arch. Why the lower arch first? If the patient is struggling with the comfort of the Nola you can remove the Nola after the lower arch is placed. To avoid getting etchant on patient’s tongue, use high volume suction first, to remove the larger globs of etch. Then rinse and suction each tooth. Clean all etchant off with water. Dry thoroughly. Apply a thin layer of primer to the teeth, covering entire facial/buccal surface (adding more on posterior brackets to help prevent bond failure). If using Opal Seal: Air dry each individual tooth towards the incisal edge (this activates the Opal Seal). Note: Assure Plus has been known to cause the DIBS tray to soften and sometimes bond to the tooth. If using Assure Plus Bonding Resin, do not apply generally to the entire tooth, but apply locally to the area to be bracketed. Thoroughly dry or light cure the resin before proceeding. Apply bonding agent to the base of each bracket, immediately before seating the tray. Be sure to cover the entire pad to the edges, paying attention to spread the agent into the corners of the pads. See page 4 for product recommendations. Flash Prevention: When seating the trays, begin with the lingual while pulling the forward to the facial as you slide it in place. This will help prevent or minimize smearing of the bonding agent. 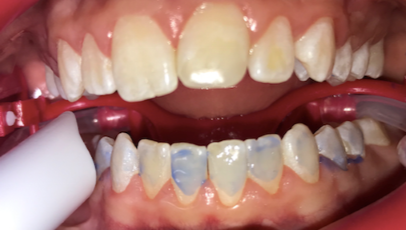 Before curing, you may want to look for, and wipe off, any excess bonding agent from the exposed gingival opening of the tray. DIBS Tray Fit: You will find that, because of the DIBS tray design, the adaptation of the bracket on the tooth surface is very intimate. After the first or second bonding, most doctors will realize they can use less bonding agent than they had originally thought. 12. Place DIBS tray into patient’s mouth. Press firmly on the tray with index and middle fingers to seat it firmly on the teeth. Make sure the tray does not bounce or rock. If the Nola is obstructive in the posterior, you may need to lift the tubing or squeeze the side-guards inward. See the picture in step 7. Once the tray is secured, light cure each tooth directly on the facial/buccal; then a second time from the incisal edge/buccal cusp ridge. Apply light pressure with the curing light on the facial and buccal surface. The curing light intensity is reduced by almost half when curing through an IDB tray; so you should double either the light intensity (turbo setting on some models) or cure time. Use a scaler to lift the tray, lingually, then move to the buccal surface. It may take a little tugging and lifting. For example, along the posterior, lift lingually and buccally at the 6 and 7, then at the 5 and 4. As it loosens, you may find it helpful to roll the tray (especially if it is sectioned) from the lingual to the buccal. Once the tray is removed, light cure each bracket again, from the gingival. After curing, have the patient gently close and stop if they are about to touch a bracket. Consider bite opening measures such as bite turbos on the lingual of teeth #8 and #9, or composite build-ups on the occlusal surfaces of posterior teeth to prevent any occlusion on the lower brackets. 1. Reliance Flowtain LV, based on your recommendation and others. 2. We are using Reliance thin viscosity Light Bond for our DIBS cases, so far. We are still trying to refine our technique to reduce composite flash. I will be happy to share any practical pearls as we increase our skills with the DIBS. 3. We use two types of brackets with our OrthoSelect cases, either Clarity Advanced Flash Free by 3M or unpasted SmartClip SL3 from 3M. The Clarity Advanced are pre-pasted with an attached fiber mesh that’s been impregnated with thin layer of adhesive. When bonding these brackets, we condition the teeth with a 35% phosphoric acid etchant for 20 seconds, rinse, follow with an application of 3M Self Etching Primer, then seat the trays/cure brackets. When using the SmartClip brackets, we prepare the teeth in the same way, but Dr. Alvetro will then apply a very thin layer of 3M’s Transbond Supreme LV low viscosity light cure adhesive to the bracket bases just before seating the trays. Using a very thin layer is key, ensuring little to no flash during bonding. After curing and removing trays, we seal all around the brackets with Vanish XT light cured glass ionomer, also from 3M. 3M Transbond Supreme LV low viscosity flowable composite. Seal all around the brackets with Vanish XT light cured glass ionomer, also from 3M. 4. The composite that we recommend is 3m Transbond Supreme LV with OrthoSolo universal bond enhancer. Suggestions: Divide the trays before trying them in the patient. 5. We use transbond by unitek, no flowable cements because there is no custom base. Hope this helps! 6. Used Transbond LR on first case and got little or no flash. 7. I used 3M Unitek Transbond supreme LV Flowable. I also used Flowtain from Reliance. I found that I like the flowable composites much more than the thicker composite. The thicker composite gave too much flash. I did like the 3M Transbond Supreme LV the best. I felt I could see the composite on the pad better before placing the tray. 8. I didn’t use a flowable. I just used my regular GAC neobond composite and used a very little bit. I cured it buccal/facial 10 seconds then gingival/incisal 5 seconds each.